Immunotherapy is based on the idea of training the body’s own immune cells to better combat cancer, infections and other diseases. A major challenge to its success has been the inability to produce enough trained immune cells to have a curative and lasting impact. Researchers have found a way to efficiently produce large numbers of trained immune cells using magnetic nanoparticles. 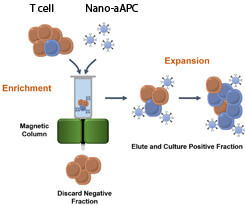 A graphic showing a process for producing large numbers of activated, customized T cells using magnetic nanoparticles and a column. In recent years, researchers have hotly pursued immunotherapy, a promising form of treatment that relies on harnessing and training the body’s own immune system to better fight cancer and infection. Now, results of a study led by Johns Hopkins investigators suggests that a device composed of a magnetic column paired with custom-made magnetic nanoparticles may hold a key to bringing immunotherapy into widespread and successful clinical use. A summary of the research, conducted in mouse and human cells, appears online July 14 in the journal ACS Nano. The Johns Hopkins team focused on training and rapidly multiplying immune system white blood cells known as T cells because of their potential as an effective weapon against cancer, according to Jonathan Schneck, M.D., Ph.D., a professor of pathology, medicine and oncology at the Johns Hopkins University School of Medicine’s Institute for Cell Engineering. “The challenge has been to train these cells efficiently enough, and get them to divide fast enough, that we could use them as the basis of a therapy for cancer patients. We’ve taken a big step toward solving that problem,” he says. In a bid to simplify and streamline immune cellular therapies, Schneck, Karlo Perica, a recent M.D./Ph.D. graduate who worked in Schneck’s lab, and others worked with artificial white blood cells. These so-called artificial antigen-presenting cells (aAPCs) were pioneered by Schneck’s lab and have shown promise in activating laboratory animals’ immune systems to attack cancer cells. To do that, Perica explains, the aAPCs must interact with naive T cells already present in the body, awaiting instructions about which specific invader to target and battle. The aAPCs bind to specialized receptors on the T cells’ surfaces and “present” them with distinctive proteins called antigens. This process activates the T cells to ward off a virus, bacteria or tumor, as well as to make more T cells. In a previous study in mice, Schneck’s team found that naive T-cells activated more effectively when multiple aAPCs bound to different receptors on the cells, and then were exposed to a magnetic field. The magnets brought the aAPCs and their receptors closer together, priming the T cells both to battle the target cancer and divide to form more activated cells. But naive T cells are as rare in the blood as a “needle in a haystack,” Perica says. Because the ultimate goal is to harvest a patient’s T cells from a blood sample, then train them and expand their numbers before putting them back into the patient, Schneck’s research team looked to magnets as a potential way to separate the naive T cells from others in the blood. The team mixed blood plasma from mice and, separately, humans with magnetic aAPCs bearing antigens from tumors. They then ran the plasma through a magnetic column. The tumor-fighting T cells bound to aAPCs and stuck to the sides of the column, while other cells washed straight through and were discarded. The magnetic field of the column activated the T cells, which were then washed off into a nourishing broth, or culture, to grow and divide. After one week, their numbers had expanded by an estimated 5,000 to 10,000 times. Because numbers of these cells could be expanded quickly enough to be therapeutically useful, the approach could open the door to individualized immunotherapy treatments that rely on a patient’s own cells, says Perica. Schneck says that the use of naive T cells could make the new technique useful for more patients than another immunotherapy now being tested, which relies on other white blood cells called tumor-infiltrating lymphocytes. Those cells are already “trained” to fight cancer, and researchers have shown some success isolating some of the cells from tumors, inducing them to divide, and then transferring them back into patients. But, Schneck says, not all patients are eligible for this therapy, because not all have tumor-infiltrating lymphocytes. By contrast, all people have naive T cells, so patients with cancer could potentially benefit from the new approach whether or not they have tumor-infiltrating lymphocytes. “The aAPCs and magnetic column together provide the foundation for simplifying and streamlining the process of generating tumor-specific T cells for use in immunotherapy,” says Juan Carlos Varela, M.D., Ph.D., a former member of Schneck’s laboratory who is now an assistant professor at the Medical University of South Carolina. The researchers found that the technique also worked with a mixture of aAPCs bearing multiple antigens, which they say could help combat the problem of tumors mutating to evade the body’s defenses. “We get multiple shots on the goal,” Schneck says. Other authors on the study are Joan Glick Bieler, Christian Schutz, Jacqueline Douglass, Andrew Skora, Yen Ling Chiu, Mathias Oelke, Kenneth Kinzler, Shibin Zhou and Bert Vogelstein, all of The Johns Hopkins University. This work was supported by the National Institute of Allergy and Infectious Diseases (grant numbers AI072677 and AI44129), the National Institute of General Medical Sciences (grant number GM 07309), the National Cancer Institute (grant numbers CA 43460, CA 62924, CA 09243 and CA108835), the Troper Wojcicki Foundation, the Virginia and D.K. Ludwig Fund for Cancer Research, the Sol Goldman Center for Pancreatic Cancer Research, the Commonwealth Foundation, and sponsored research agreements with Miltenyi Biotec and NexImmune. Under a licensing agreement between NexImmune and the Johns Hopkins University, Jonathan Schneck and Mathias Oelke are entitled to a share of royalty received by the University on sales of products derived from this article. The terms of this arrangement are being managed by the Johns Hopkins University in accordance with its conflict of interest policies.